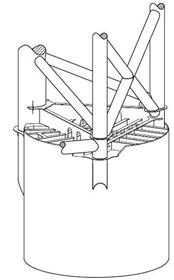 Suction cans are the main foundation element of the offshore substation. IMPaC provided geotechnical engineering design verification of the suction cans of a self-erecting offshore substation. FEM calculations for post installation soil parameter, and for degraded soil parameter (due to cyclic load from wind, wave and current) have been carried out. Furthermore, the numerical calculations were performed considering no scour and 1.1 m scour depth. The suction cans have a diameter of 11 m, a penetration depth of 9 m and clearance between suction can equal to 40 m.
The geotechnical design verification was carried out according to the BSH requirements.